I'm still working on the house. My "Finish What I Start" pledge for this year is keeping me from putting it away. I have to say I am enjoying it. I finished this little redwork girl, but there are several more that I want to stitch and put together, so this isn't a total finish yet. Congrats on the cute finish Pamela. I love the house. Can you tell me the name of the chart and designer please? Good progress on your house and the red embroidery is fun and there are more blocks for a set? And I saw your photos from the quilt festival, inspiring. I think some of the best quilts/embroidery/stitching is done in Japan. Your house is gorgeous, Pamela. I will be glad to see it finished. 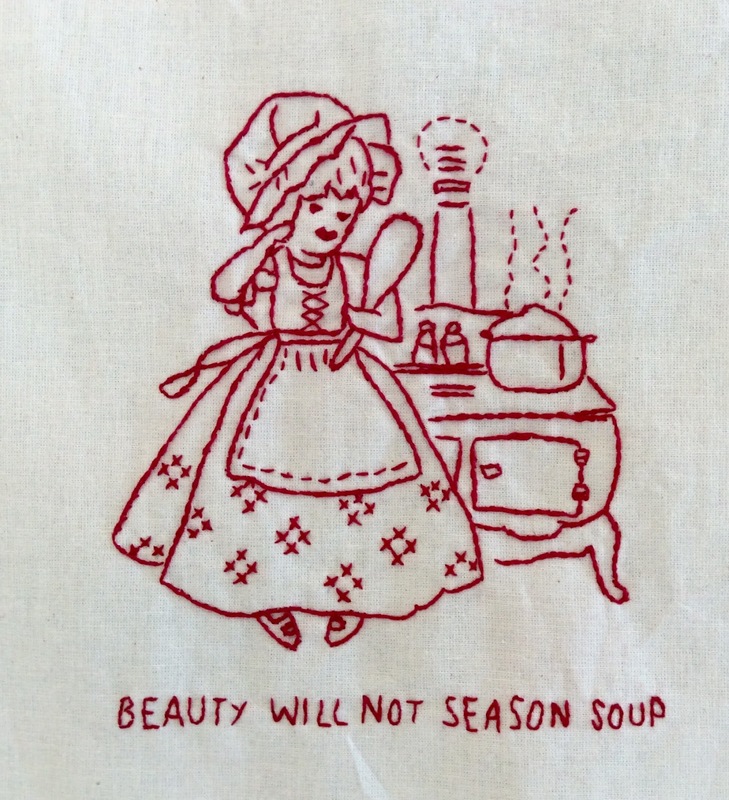 And your redwork is simply beautiful. Hugs, my friend. It is good to make promises to oneself! 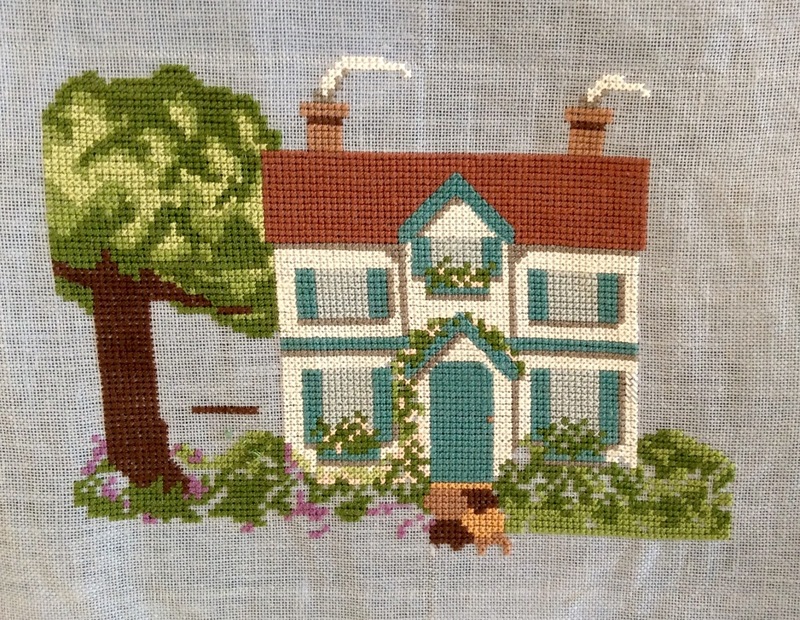 The cross stitch house is really charming. The house is lovely Pamela,and the red work beautiful. Well done on getting finishes. Both the house and redwork looks beautiful. Me too want to finish what i start. But my mind is wandering on various projects. Keep going! You inspire me. 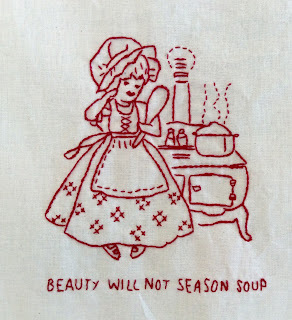 Pamela: What a cute saying beauty will not season soup love it. You are doing well! Love the house and the pretty redwork! I wish I could finish some of my projects, I am trying, but new ones keep creeping up on me! I too love your house! And I look forward to seeing your redwork piece all finished. This is a lovely start. The house looks great! Not much more to go now.